Microneedle radiofrequecy is a novel technology which employs radiofrequency energy for treatment of the skin. How does microneedle radiofrequency work? The concept of microneedle radiofrequency differs from that of fractional lasers. Here the special gold-plated needles enter the skin to heat the skin deeper than most lasers. The microneedling gives one an opportunity to program the depth one must reach unlike a fractional laser as well as the exposure time of the radiofrequency making it more or less aggressive depending on the indication being treated. 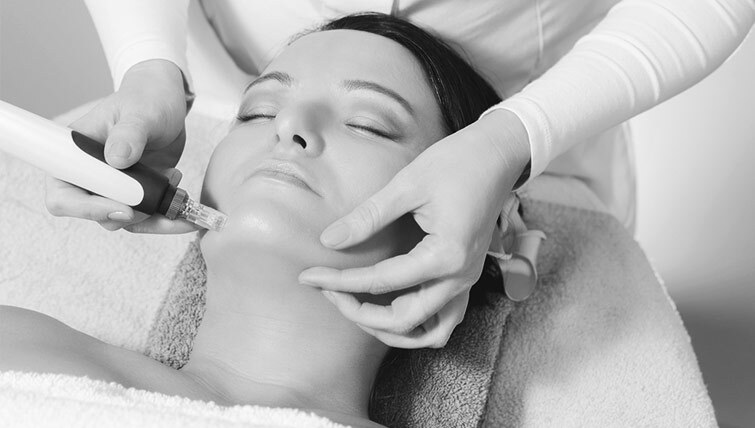 The microneedling eventually results in heating up the skin and remodeling of collagen – resulting in evening out the skin, pore reduction, improved scars. Microneedling is actually very safe as the needles don’t heat the top of the skin and in fact can be used in even darker skin types with a lesser downtime than fractional lasers. Where all can it be used? For skin rejuvenation – The Secret Micro-Needle Fractional RF System used at Veya Aesthetics is the ideal technology for skin lifting, tightening and rejuvenation by utilizing minimally invasive micro-needles to deliver controlled RF energy directly into various depths of the skin. It has had outstanding success for all skin types with very low risk of side effects and PIH – a key difference when compared to optical based treatments (IPL & Laser). Can I go to work next day? Yes, with the SECRET microneedle RF system there is minimal downtime and one can go to work the very next day.